NEW! Tear Away and Cut Away Stabilizer are now available in Black! In addition to our "house brand" stabilizers, we carry the complete line of Foundations brand embroidery stabilizer. We offer our stabilizers by the roll or we can custom cut by the yard. When purchasing by the yard, use "quantity" in your shopping cart to specify the number of yards. And, as with all our products, shipping is always FREE! Also see our 505 Spray and Fix Temporary Fabric Adhesive! All Threads brand Tear-Away / Wash-Away Stabilizer is a value-priced, all-purpose stabilizer with a twist - use it just like any ordinary tear-away stabilizer, but after a few washings, it washes away cleanly, leaving an extra soft feel. Perfect for all medium-weight fabrics. Product is 8" wide. Available in full rolls only. If you embroider on baby blankets or children's clothing, you know how irritating the back of your embroidered design can be against delicate skin. All Threads brand Comfort Mesh™ is an iron-on liner material that solves that problem for good! Simply cut a piece slightly larger than your design and iron it on over the back of your finished embroidery. No more scratches - just pure comfort! Product is 11" wide. Available in full rolls only. Foundations was adapted specifically for the home embroiderer from a line of top-quality industrial products. These stabilizers have been used by professional embroiderers for years with great results - and now you can enjoy the same excellent results in your home projects! Aqua-Melt is the ultimate wash-away stabilizer. It looks and handles like an ordinary stabilizer, but washes away completely in warm water! Excellent for use as an embroidery backing or topping and is perfect for stand-alone embroidery such as lace or emblems. The ultimate wash-away stabilizer is now available with an adhesive back! Combines all the best features of regular Aqua-Melt, plus the peel and stick adhesive backing makes this the perfect stabilizer for any small or hard to hoop projects. Simply hoop the stabilizer only, adhesive side up; score the protective paper around the edge of the hoop and peel it off, then adhere your item to the hooped stabilizer and you're ready to go. After embroidering, rinse the item in warm water or a gentle wash cycle and the stabilizer completely washes away! Suitable for use as a backing or as a topping and, just like regular Aqua-Melt, it washes away completely in water! NOTE: Adhesive-Back Aqua-Melt stabilizer is not recommended for use in "Fiber Lace" projects or in any application where another embroidery backing or topping film will be directly applied to the adhesive side of this AquaMelt product. Medium weight; tears away cleanly and effortlessly. Recommended for stable fabrics such as nylon jackets, silk blouses, neckties, etc. Use multiple layers if necessary. Product is 11" wide. Available in White only. This heavy weight tear away stabilizer gives excellent stability and is perfect for any tear-away projects requiring extra stability. Use on shirts, jackets, pillow cases, sheets, etc. Multiple layers are not recommended with this stabilizer. NEW! Now available in White or Black. Mid-weight tear-away gives excellent stability and the adhesive backing is especially useful for embroidering small or hard to hoop items. Recommended for most types of fabric with a smooth surface for the adhesive to bond with. Very stable and light wight, this textured nylon stabilizer provides excellent stability and reduces unwanted show-through. Recommended for golf shirts, sweatshirts, jackets, t-shirts, etc. Use multiple layers for challenging designs. Excellent stability but still soft to the touch. Perfect for the most challenging designs. Recommended for knits, fleece, jersey, piques and all other stretchy materials needing stability. Use multiple layers for challenging designs. Use on top of item to be embroidered to prevent fabric from peeking through the embroidered design. Recommended for towels, pique knits, velour, corduroy and similarly textured fabrics. Washes away with water. A heavier weight film that can be used like our light weight topping. Plus, this film is heavy enough to be used directly as a stabilizer. Washes away with water. Excellent as a stabilizer on almost any fabric. Can also be embroidered directly on, to create lace and many other creative projects. Recommended for stretchy materials, lace and other fabric-free designs. 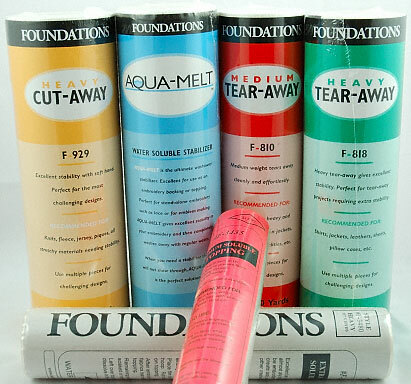 Foundations and Aqua-Melt are trademarks of Hammer Brothers, Inc.